This had an unusual but delightful taste, has a lot of spices in it, and although it looks quite daunting, is really very easy to make, and just that bit "different" to an ordinary curry! The apples give this dish a special lift. Heat the oil in a non stick wok and fry the diced onions with the bay leaf, cloves, cinnamon and peppercorns for about 4 minutes. Add the chicken pieces and continue to stir fry for at least 7 minutes. Lower the heat, and add the garam masala, ginger, garlic, salt, chilli powder and ground almonds, and continue to stir fry for about 10 minutes. Pour in the yogurt and cook, stirring a few times more, for about 15 more minutes. Add the sliced apples and the chopped coriander. Cover and cook over a gentle heat for about 20 minutes. While this is cooking cook your rice. Make sure the chicken is cooked through, and serve garnished with the flaked almonds and whole coriander leaves, if using. When the rice is cooked, drain the oysters. Chop the capsicum into small pieces, and finely chop the shallots. Mix the rice, oysters, capsicum, spring oniones, and chives. Mix the French dressing, lemon juice and crushed garlic, and add to the rice. Toss lightly, and serve with the curry. 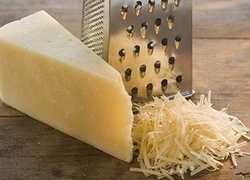 Have you ever cut yourself while grating food?